In reading through this excellent thriller, I couldn’t help but bemoan the fact that filmmaker, Alfred Hitchcock, is no longer with us. This would have been a terrific book for him to translate to film. ZERO COOL has all the elements of a classic Hitchcock experience. The protagonist is an educated, professional who inadvertently is sucked into a criminal enterprise and against his will, soon finds himself the target of several groups all intent upon bringing about his demise. Radiologist, Peter Ross, is on a much needed vacation in southern Spain when he’s approached by a mysterious group of men to perform an autopsy on a body that has to be shipped to the United States for burial. Ross does his best to put them off, but when they threaten him, he relinquishes and performs the illegal procedure. Illegal because he is told to put a wrapped package into the cadaver’s chest before sewing it shut. Now he knows these criminals are attempting to smuggle an unknown object into the states. Again, classic Hitchcock, in that whatever the mystery object is exactly is completely unimportant to the story as its very existence as a plot device to endanger our protagonist is only real purpose of being there. Soon poor Dr. Ross finds himself, beaten, shanghaied to Paris where meets another group of unsavory characters and then once again returned to Spain for shady adventures. All the while accompanied by a beautiful woman who, because of their flirtatious tryst, finds herself entangled in his dilemma. ZERO COOL is a really fun thriller that has its share of surprises and twists, all done with a deft hand that never allows the pacing to lag. By the book’s finale, in a rather well known Spanish landmark, another nod to Mr. Hitchcock, I had been thoroughly entertained from start to finish. What more can you want from any book? When people ask me why, after a life time of reading, I still enjoy it so much, I am never hard pressed to answer them. All I have to do is hand them a book like this one. Born in 1946, I grew up in the 50s, when newspapers still carried the Flash Gordon strip and early television was offering up classic science fiction adventure melodramas like Tom Corbett; Space Cadet, Captain Midnight and Commando Cody; Sky Marshall of the Universe. It was a rich time for any kid with a vivid imagination. Keep in mind this was not what fans would call “hard” science fiction that was being practiced by the likes of Isaac Asimov, Arthur C. Clarke and Robert Heinlein. Nope, this was pure, unadulterated space opera on a grand scale; the kind George Lucas would return to amazing popularity in the 70s with his debut of the Star Wars saga. SPACE VULTURE harkens back to those early days when heroes were chiseled jaw, noble and always ready to come the rescue and villains were dastardly scoundrels capable of the most monstrous acts without blinking an eye. Such is the culprit in this wonderful, exuberant adventure. Space Vulture considers himself the epitome of the human race. He is the handsomest, smartest, most talented individual ever born and by that irrefutable logic, he should be the supreme ruler of the universe. Petty laws made for lesser beings should not impede his efforts towards that lofty goal and they don’t. He robs, pillages and destroys to his heart’s content, completely oblivious to the suffering he causes others. 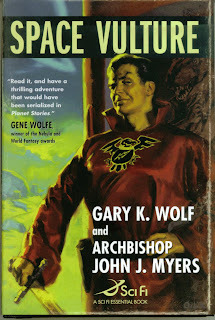 When Space Vulture, and his zombie soldiers, raid a small farming colony on the fringes of the galactic empire, he not only nets hundreds of healthy, fit men and women to sell in the slave markets of unscrupulous worlds, he also, by sheer accident, captures his most ardent nemesis, Marshal Captain Victor Corsaire, the most famous and successful lawman known throughout the stars. Also among his prize catch is the beautiful widowed foreman of the colony, Cali Russell. By some quick thinking, Cali manages to hide her two sons, eleven year old Eliot and seven year old Regin, so that when the Space Vulture lifts off with his human cargo, they are left behind, still free. The boys soon discover the insidious villain has left one other behind, a small time space con-artist and thief, Gil Terry. Terry’s only desire, having somehow managed to escape the Vulture’s clutches, is to find a spaceship and go his way, having no problem deserting the two helpless boys to whatever fate awaits them. Unfortunately for Terry, the boys aren’t as helpless and he believes and they trick him into accompanying them on a mission to find the Space Vulture and rescue their mother. The book is filled with non-stop action and adventure as the boys, with the supposedly heartless Terry, manage to overcome and survive one disaster after another while chasing after the Space Vulture. With each new victory, the thief’s stoic nature slowly begins to thaw as he gradually comes to care for these likeable lads and against all his criminal rationale, he actually finds himself becoming their true ally and protector. Meanwhile, aboard the Space Vulture’s magnificent spaceship, Cali and Captain Corsaire join forces to plot their own escape and somehow find a way to thwart the Vulture’s plans. In the process, Corsaire, a man dedicated to lady justice, begins to recognize in Cali Russell and exceptional woman as she stirs strange, new emotions in his lonely heart. Believe me when I say Wolf and Myers pull out all the stops here and have woven a grand tale destined to be a hailed as a classic in the genre. It is bold in its unsophisticated narration, painted with the broadest strokes imaginable, yet deftly giving us characters so true to life, they become real from the moment you meet them. I love space operas and SPACE VULTURE is one of the finest I have ever read. It deserves to win awards, but more importantly, to find a huge audience, as I’m sure it will. Do not miss this one, that would be the biggest crime of all! !